RCJ Kumamoto Church’s pastor wrote a letter of feedback and thanksgiving. Please read it here below. both in the whole country of Japan and overseas. From the bottom of our hearts we lift up and praise the name of the living God, the almighty Creator of the whole world, He who with his loving hand rules everything! On the 14th of April 2016 and 16 days later, two large earthquakes rocked the area of Kumamoto. Many people were killed, houses collapsed and people lost their livelihood. Even today many people are still experiencing the daily strain of a prolonged life in evacuation conditions, the fear of aftershocks, great financial difficulties. They muster stressful efforts towards the recovery of their living conditions. The main shock occurred in the early hours of a Saturday morning. The safety of all the members of the RCJ congregation of Kumamoto could be quickly confirmed and on the next day, the Day of the Lord, we could observe our worship service. Except for the eight attendees, there was one young man was from the Eastern Presbytery, who brought supplies and water which he collected on his way in the City of Fukuoka. The next day, the 18th (Monday), the minister from RCJ Nagaoka congregation in Fukuoka, together with his wife and a deacon visited Kumamoto congregation, bringing a lot of supplies which they collected from homes of their congregation members. They also cleaned the chapel and manse of all the scattered items. All the supplies were arranged in the chapel and a sign was put outside the church building reading: “Relief supplies have arrived!” People from the neighbourhood immediately responded and one by one arrived at the church entrance. From about 4 pm the RJC Kumamoto church began with a humble ministry of being a relief center for our community and the victims around us. Since then many have visited the RCJ Kumamoto relief center. People from the neighbourhood who happened to pass by, people who were invited by friends and acquaintances and also people from far away who have heard about the center came for help. Some came on behalf of others who could not come themselves, some even came once to fetch a big quantity of supplies to distribute at other evacuation centers. There were those who came to fetch some needed items and returned immediately to their homes and there were those who stayed at the chapel, drinking tea and chatting. The chapel also became the playground/room of children who had extra time after school or over weekends. Young mothers brought their children and while drinking tea they often spent long hours at the church just relaxing. During their stay each one shared their experiences of the earthquake. They talked about their anxiety amidst all the aftershocks and their fears of a next big earthquake. There were also those who shared the troubles and burdens of their whole life thus far. We have been receiving opportunities to meet with people from the neighbourhood and to share with them as never before! Children happily said: “This place is like heaven, where we receive tea for free!” Many people were happy for the signboard that was erected, the doors of the church that opened and that they could enter the church. A number of children have been coming to the Sunday school (for the first time). Also after Sunday school, these children would stay on, during the worship service play quietly in the children’s room, have lunch together with the congregation and even stay until evening, when they will go home. There are also adults who have been coming for the first time to the Sunday worship services. Thank you for your precious donations which you offered so generously. We express our heartfelt gratitude and appreciation in the Lord to all of you, our dear brothers and sisters who have taken it on you to carry the Kumamoto earthquake and our Relief Center in your prayers. People in the midst of evacuation life came to the center tired, received supplies and always left with much more calm facial expressions. When they saw all the supplies coming from churches all over the country they became happy and received new strength. Through their interaction with the volunteer staff-members they received healing and encouragement. All of them expressed sincere gratitude. All the many “thank you”’s we have received we want to send to all of you. Further, the fact that we could continue until now is also because of the co-operation of the Kyushu Christian Relief Center. We received a lot of support from people helping with the concert as well as the kids English class. 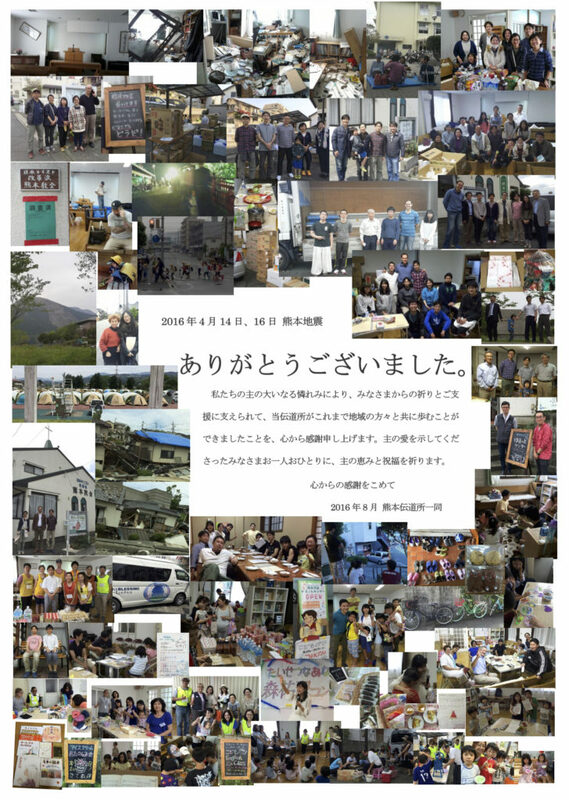 Kuriyama missionary couple from “Yarn Alive” in North-East Japan took full responsibility in the launching of our “Knitting Project.” From Sendai in the North to Kumamoto in the South they traveled twice by car to deliver a lot of wool and knitting equipment. Also from the people form North-East Japan who are in a similar situation we received warm support. From other Church Denominations we received prayer-support, pastoral visits and material support. From the depth of our hearts: Thank you very much! “When one member suffers, all suffer together, when one member rejoices. all rejoice together (1 Corinthians 12: 26).” Likewise our walk until now and from here further is together with all members of the Body of Christ. Everything is under the rule of our Almighty Father, the Lord God. Looking joyfully forward to the abundant fruition, on that Day of the Lord, of our prayers and works. Our desire is to steadfastly continue with this ministry. May the unlimited love and grace of the Lord be with each one of you.